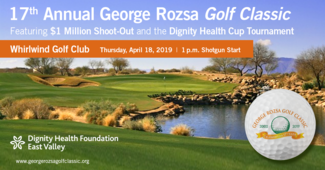 Join us as we continue the Rozsa Family legacy at the 17th annual George Rozsa Golf Classic on Thursday, April 18, 2019 at 1pm at the Whirlwind Golf Club in Chandler, Arizona. Thanks to generous supporters who were inspired by what our father started many years ago, more than $2 million has been raised in support of patient care by adding new state-of-the art equipment and buildings, creating community outreach programs, and founding innovative support groups. Funds raised from this year’s event will directly support the Dignity Rising campaign to advance health care in the east valley with the addition of a new Women’s and Children’s Pavilion at Mercy Gilbert and a new patient tower at Chandler Regional. This year we are adding a twist of fun to the usual charity golf event featuring a $1 million Shoot-Out and the Dignity Health Cup Tournament. Instead of traditional foursomes, teams of two (2) will compete in various challenges throughout the day. We will start at 1pm with lunch and a 9-hole Par Three Challenge. Each team will have the opportunity to win a car, vacation, or $10,000 cash prize by hitting a hole-in-one on the course. The person closest to the pin on each of the entire 36 holes will compete in a Shoot-Out for one chance to win a Million Dollars! Also as a part of the Cup Tournament, the teams will compete in a Corn Hole Tournament and Skills Challenges to end the day. Greet people as they arrive and direct them to registration, lunch, activities, etc. I am happy to be at the table that gives the goodie bags and shirts to the golfers. Sell drawing tickets for the opportunity to enter into the super bowl experience drawing. I would like to be paired with Hazel Sayco? Staged volunteers directing traffic, dropping volunteers off and pick up at conclusion at hole in one opportunities, handing out water to volunteers, and giving volunteers restroom breaks, etc.